Today marks a very special moment in the life of Lady V as we're proud to announce a brand new range - Lady Voluptuous - which has been created in association with the gorgeous model and blogger Georgina Horne. 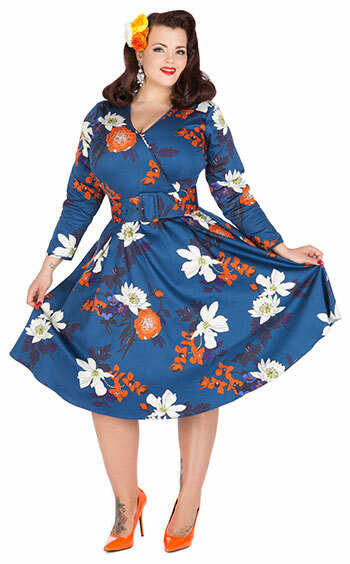 This range is bringing vintage style, and a wonderful variety of colours and patterns, to ladies of the more voluptuous kind. With the guidance and inspiration of Georgina we know that you will find something different here, something that will allow you to have fun and express yourselves like you have never done before. This week we had a photo shoot, where Georgina finally saw the results of her hard work. In between modelling her first ever range Georgina was asked about this magical moment. What does it feel like to have your own line of dresses? I couldn't quite believe it when Lady V first asked me last year, it just doesn't feel real, it's kind of crazy. I'm just really excited to see what people think of it and tell people this is just the beginning and there's so much more to come. Hopefully there is something for everyone here and people can go outside their comfort zone and for fun. Some women might have never worn a skin tight dress because they've never had one but why not give it a try. And what was it like when you saw them? When I first saw them I just wanted to share them. I was texting my mum pictures of them, texting my boyfriend pictures of them. It's been very exciting. 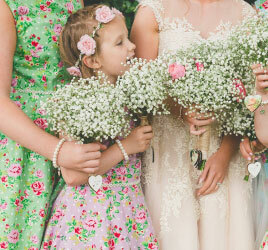 How do the dresses feel and what styles have you gone for? Oh, they're awesome! A bit of everything, there are some sparkly skirts, quite a few wiggles, with lovely peplum hems and we've got some tea dresses. I like to have things like strapless dresses with detachable straps and shorter dresses, longer dresses. I just really want to give women the options that maybe they haven't had before. When considering this line how did you approach your bust? Some of the dresses do show it off, definitely, but it's kind of hard because I have to think, not everyone wants to, not everyone has a larger bust, not everyone can wear dresses that show that off. There's options for women who want to wear something a bit more plunging, a bit more figure-hugging, or showing arms off. I really would like every box ticked and hopefully we've done that. What is the size range and have you approach this with any ladies in mind? The range is in sizes 16-32 and yes I have definitely got bloggers and people that I know in mind that would love certain dresses. In fact there is one blogger, who I think she's about size 32, who I know will just love everything, and then there's definitely sort of slimmer women, in terms of slimmer plus size, who I think would adore these dresses. I don't think I've got a particular person in mind throughout but I just think, okay, that person would definitely love this style of dress, and I think this person would definitely go crazy over this, so it's nice that I know women who I think would be wearing the designs. You're here in part because of your blog, so what made you begin writing it? I started it about four years ago, because I entered a few very amateur, just for fun, modelling competitions and after the second one I realised that people had quite liked seeing someone like me – I was probably the largest person they'd ever had enter it – seeing how things fit me and I was able to talk about how things fit me. I thought if I had a blog, I could show clothing and lingerie options I've found that fit me and talk about how they fit and where to buy them from, and it sort of went off from there. All the amazing opportunities I've had along the way have come from just hopefully staying true to that, persevering and keeping fresh content coming in once or twice a week. It's just to show women who maybe don't look like the plus size or the straight size model that this is how things really look, how they feel and give sizing advice.